I just installed Leopard and after setting up option left / right arrow in iTerm, I realized that option+delete did not kill the word to the left of my cursor. I think this somehow worked in my old pre-leopard setup, although I had done nothing to set it up. Now that you have an escape sequence that doesn't require the Ctrl key, you can map option+delete to it in iTerm. In iTerm, go to Bookmarks > Manage Profiles. Choose Keyboard Profiles > Global and click the + button to add a key binding. 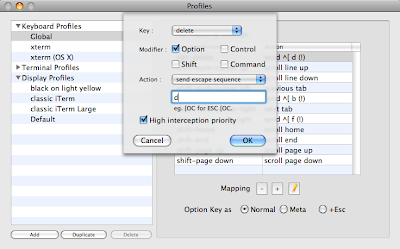 Choose delete from the dropdown, check the option checkbox, and then in the Action: dropdown choose escape sequence. In the text field that appears, type d. I also checked the High interception priority checkbox for good measure. Hit OK and you'll notice option+delete now deletes the word to the left of your cursor. Sweet!